export OBJ with skinning and morphs not working? Trying to export a DAZ figure (V3) as OBJ with skinning and morphs, but generic V3 is all that I get. I have tried selecting the Animation Group and also just the model. Both times I check skinning and morphs but no cigar. I seem to recall a thread where someone had a similar issue a few or a couple months ago, but I don't recall if there was a solution or what it might have been. Ugh. Do we even HAVE a bug tracker? on Windows so might be a Mac issue but does it make a difference if you use save as or export with figure selected? 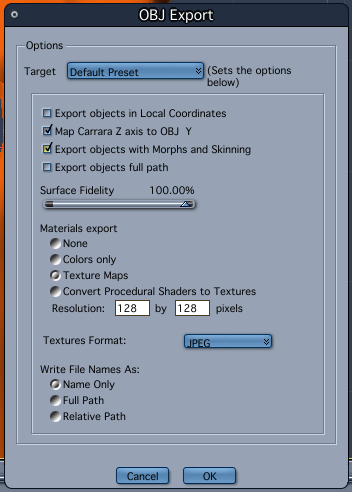 I don't think it is possible to export to obj with all morphs. I could be wrong, but I think obj cannot handle this. I think this option is for when you use a morph (big head for instance), it is exported with a big head. That is all. you're quite right. OBJ cannot hold additional morph shapes, it's just a model format. "Export with Morphs and skinning",.. should export the selected figure in it's "Current pose" or deformed state. So it's kind of a "Snapshot" of your figure in it's pose. What it doesn't do is export all of the different shaping morphs contained in a figure, ...or anything to do with the skinning or rigging of the figure. It doesn't create a skeleton, or export the morph parameters,.. which is what the option name suggests. I cannot open C7 on this system (have to search for the font fix). OBJ export is one of those things I just took for granted so I don't know when it broke. Otherwise I would have campaigned to get it fixed in 8.5... I'm feeling very lucky that Fenric's OBJ Sequence Exporter exists. I keep asking but no one answers (so I assume no answer IS the answer...) but *is* there a bug tracker anymore? That really depends on what you mean by a tracker. You submit a bug as a help request to Tech Support, marking it as a bug report. You can then check your request to see what is being done by checking your existing requests. You submit a bug as a help request to Tech Support, marking it as a bug report. You can then check your request to see what is being done by checking your existing requests. Thanks Chohole... Assuming I use the "Contact Us" form, there doesn't seem to be a way to mark it as a bug report. Do I just add "BUG REPORT" to the name of the issue or something? Yes. It is an interim solution, but that is how it is working for now.